I’ve been actively speaking over the past few weeks about a new strategic mindset I believe B2B marketers should adopt today — a ‘mass one-to-one’ strategy. This is a posture where marketing manages scale, targeted, engaged and two-way dialogue with prospects, upstream from sales-team interaction and ultimately with the purpose of paving the way for a sales close. 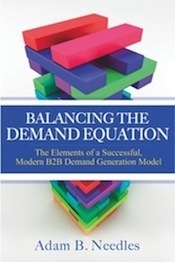 This is much more than mere lead generation; moreover, the growing need for such a strategy really is the natural extension of my recent observations about how the nature of the B2B buyer is changing and the permanent shift this is affecting in the roles of both sales and marketing team members. The intent of a mass one-to-one strategy is to close an emerging sales-cycle gap — where the buyer is seeking information and having dialogue about a purchase, but is doing so on his/her own terms, mostly online (including via social media) and prior to ever engaging a sales team member. The strategy thus attempts to fill this gap by having marketing replicate and replace some of the engaged, ‘customer-centered selling’ interaction a sales team member might have pursued before the nature of the buyer began changing. The strategy focuses more on initially responding to ‘pull’ and initial ‘inbound’ activity and on conforming to the buyer’s cycle than on driving interruptive ‘push’ tactics. This means knowing the buyer better than ever before. It also means marketing has a more strategic … and complex … role than ever before. The good news is that the same Internet that brought this change also is fostering new tools to respond to it. By embracing a holistic lead management strategy and by deploying a robust marketing automation platform, marketers can get start to get some control. In fact, mass one-to-one sounds great and is more achievable once you have technology like this in place. Yet most marketers will admit that the idea of building an endless number of dynamic, anticipatory, customer-triggered campaigns for some infinite number of customer types and scenarios is daunting. Where do you stop? How do you get any economies of scale? Such a commitment of time and resources — without limits — can result in a declining return that does not match the investment. So how do we get our arms around this ‘brave new world’ of B2B marketing and get going with mass one-to-one without blowing a gasket? In particular, how do we focus our marketing automation campaigns to get the most bang for our buck? I believe the answer — the ‘secret sauce’ — more than ever is personas.